I can remember as a child getting the advent calendars with a little piece of chocolate hidden within the perforated square of each day in December. Not the easiest way to do an advent calendar with three kids still at home. What do you mean we have to take turns? but other creative deadlines didn’t allow me the luxury. (whoops . . . i was obviously experiencing a dyslexic moment. This concept is very unique in that it’s just so darned flexible! which are hidden behind the tag shape. So it’s a tag, with a secret behind it. You can put candy in there, a little note, gum, a Hot Wheels car maybe, Lip Smackers lip gloss . . . anything fun and small . . . or even bigger if you want to make the boxes bigger! I made mine (and the shapes are sized this way) at 1.75″ wide and 3″ tall and the box is about 1/2″ deep. Of course, in the wonderful land of die cutting, you can always make it bigger. My plan is to get a 16×20 frame–no glass–and string three rows of wire to hang the boxes from with clothespins spray painted in red and silver…maybe white….maybe black too. Of course, there are sooooo many ways you can display and/or use them! Tie them to a garland with string. Hang them from a string of lights over your mantle. Skip the box and just use the tags. Use them in your December Daily . . . or any Christmas page. I also used a mat silver cardstock that I’ve had for like ever . . . along with shiny silver cardstock. 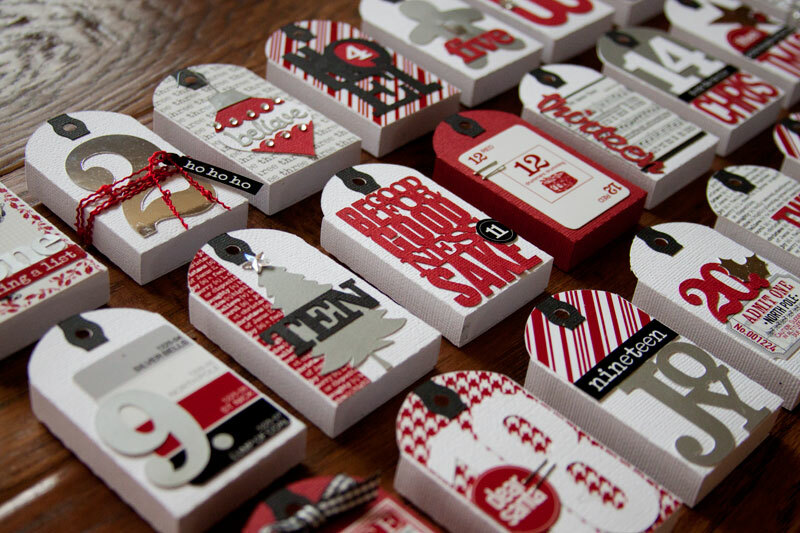 You can also cut boxes from your own holiday paper. I liked the cardstock method and sticking to red, white, silver and black . . . but it’s all up to you! Print the 8×10 candy cane background found in the PROJECT_Print_Files and use to cut some of the pieces. Assemble decoration first on textured/decorated side. Assemble the box by placing adhesive on the very bottom rectangle section, the two side squares, and one side of the back–all on the textured side of the cardstock. Flip it over, and roll up the bottom portion of the box so that the pieces form the ‘tuck in’ part. Fold the side of the box with the adhesive inward first, then fold the outside on top of it. Adhere ‘2’. Wrap string around, thread ‘ho ho ho’ and tie in a knot. 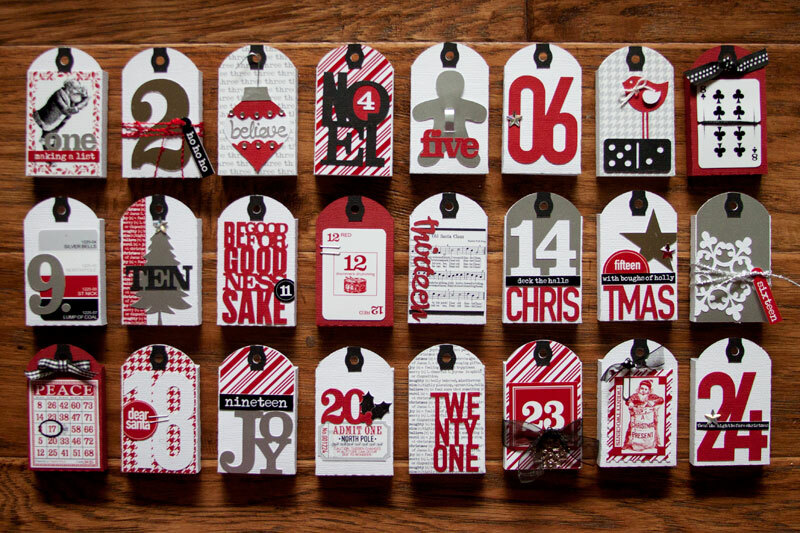 Adhere candy cane background tag shape. Adhere ‘4’ to red circle and adhere behind ‘Noel’. Adhere ensemble to box. Adhere a small section of foam between the two slits of gingerbread man cookie cutter. Thread small grey strip through slits and secure to foam. Adhere to box. Adhere ‘five’ on top of that. Adhere ’06’ and accent with star gem or rhinestone. Use a pop dot under the wing and adhere to bird. Add ribbon and rhinestone, if desired. Assemble domino. Adhere bird and domino to box, tucking the legs of the bird behind the domino. Cut notches on the center sides of the ‘8’ card. Wrap string around and adhere to box. Tie a ribbon in a knot, trim ends and attach to box with a glue dot. Adhere paint strip card to the right side of the box. Adhere ‘9.’ to left side of box. Adhere definition word strip to left side of box. Adhere tree. Adhere ‘TEN’. Add star gem on top. Adhere ‘Be Good’ and ’11’ as shown. Adhere card to box and secure with staples. Adhere music to black background and adhere to box. Adhere ‘thirteen’. Adhere grey tag portion to box. Adhere ‘deck the halls’ to base of grey piece. Adhere ‘CHRIS’ and ’14’ as shown. Align ‘with boughs of holly’ with the title on the 14 box. Adhere ‘TMAS’ as shown. Add large star, having the right edge hang over a little. Trim. Adhere ‘fifteen’ title. Add red star gem. Adhere grey tag piece to box. Adhere snowflake so that a small portion hangs over the edge. Trim. Wrap string around, thread ‘sixteen’ and tie in a knot. Adhere Bingo card to box. Tie knot in ribbon, trim ends and adhere to box with a glue dot. Adhere ’18’. Adhere ‘dear santa’ so that it overlaps the left a little and trim. Secure with staples. Adhere ticket, ’20’ and holly in that order. Adhere grey/white definition piece to box. Adhere ‘twenty one’ as shown. Place paper clip on stamp. Tie ribbon on top of paper clip. Adhere ensemble to box. Adhere candy cane background to box. Adhere ’23’. Wrap ribbon around and accent with snowflake charm or jingle bell (which is what I wanted, but opted for the snowflake since I didn’t have a bell available). Adhere ’24’, ’twas the night’ word strip , and star gem. The composite cut files are set up similar to the This+That kits and can be found in the PROJECT_Cut Files directory. I have it put together as I created it–in the color scheme I used. But you have total freedom to mix it up if you’d like :) The cut files are shown here in color for reference, but won’t appear that way when you open them. The composite print file looks like this and can be found in the PROJECT_Print_Files. It comes as an 8×10 file, so there shouldn’t be any issues with a photo developer accidentally changing sizes, if that’s where you’re choosing to print it..
And FYI, I didn’t save all those PNG images individually. I only saved some of the cards, music, and words that I thought might be used as a larger image in other projects. When I get my ‘just the right’ frame, I will put it all together and share! AWESOME!!!! I am substitute teaching today and can’t wait to get home and get this started for my little cousins! Gorgeous. Wow to infinity. Thanks! Not to be picky but your 22 and 23 are swapped in the picture! It’s all good! BAH HA HA HA!!! Whoops! Totally puts me in the mood for Christmas! Gorgeous work. LOVE it!!!! OMG. If only I weren’t leaving tomorrow for Thanksgiving and could actually put it together! OH MY GOSH! These are incredible!! I SOOOO want to make these for my niece and nephew…but I’m afraid once I got them done I would want to keep them for myself!! I guess I could go “visit” them, since my sister-in-law lives right next door! As we have all said a million times before…Kerri, you are AMAZING!! Oh wow! I just love these! I am going to forgo making the boxes and do all the tag fronts to be the numbers for my December Daily! OH WOW!!! That is amazing … can’t wait for my Cameo to arrive so I can get making but may not get this made for this Christmas!! Might just make it and hang it!! So so stunning!! Thank you!! I am doing the DD and I NEED embellies! I LOVE your advent and I would love to do this for DD as well!! VERY COOL KERI! You are just AMAZING!! This is just fabulous!! Ho! Ho! Ho! So this is what you had up your red velvet sleeve! Totally wonderful, and it’s a good thing after all the suspense! This is just so cool with the printable parts as well as cutting parts! Thanks for sharing! Oh, I love the countdown calendar. It’s perfect! Like Cari, I would start working on this if I was heading out of town! I will be thinking about it all week! Kerri, I just love this finished result. Kerry, this is an amazing way to make an advent calendar. 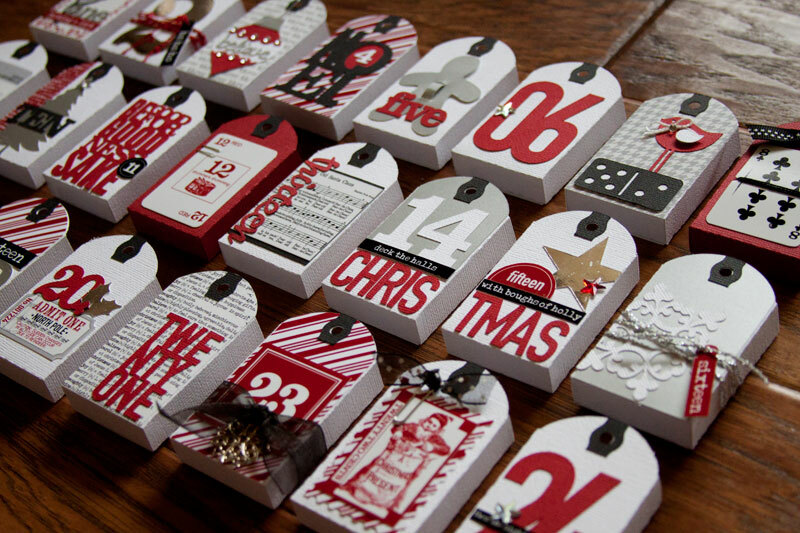 I have long been wanting to make advent calendars, but haven’t found such a nice way to make an advent calendar. Thank you so much for sharing this. i can’t wait to do this one it is spectacular, thank you kerri another winner! Wow! Yesterday I just received my Silhouette advent calendar kit in the mail, but after seeing this I may have to do TWO advent calendars this year! (It will make up for all of the years that we didn’t do one!) This is just absolutely gorgeous. I am new to your site/blog and I have to say that I am simply in l.o.v.e. with your products and your beautiful style. Thanks for sharing your talents with us! Wow! Another wonderful project. I’ve been busily making various This and That projects on printer’s trays for family members and now I know I must have this to create for my grandkids. OMG!!! I LOVE YOU!!!! I am a HUGE collector of advent calendars. I am making one now and you can bet that this will be next on my list!!! YAY!!!! Thank you for coming up with this awesome advent calendar, I have been looking for one that I liked enough to make and this is it. Absolutely to die for!! Amazing job, Kerri! Keri, I can not believe how creative and computer literate you are… at the same time! 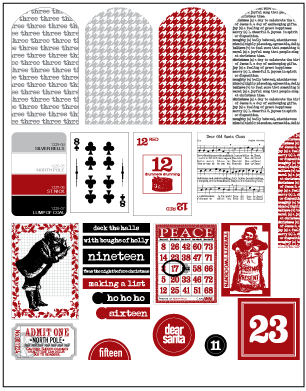 Wonderful project and so adaptable for pages and cards beyond the advent calendar. Can’t wait to play. Yet another wonderful kit !! Your talent blows me away. I am going to make this for my 2 Nephews ! SUPER DANG CUTE, MY FRIEND!!!! I am in LOVE with this! It was sure fun to make and see it all come together. Can you cut these with the sillhouette ? You sure can! There are a few file formats in the kits for the various cutters out there. oh.my.goodness. 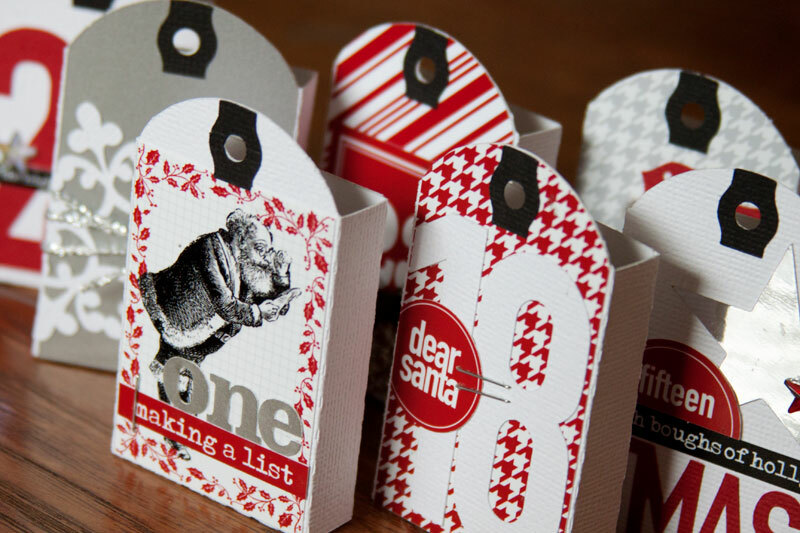 This is absolutely the cutest, most fabulous advent calendar project kit-thingee I have EVER seen. I still don’t have my Cameo but I am SO buying this…maybe I’ll be able to make it in time for this year still. THANK YOU!! I think I might make one of these this year! I have 2 kids at home, ages 16 and 10 and think I will let them take turns opening a box. Might also teach them to get along a lil more too, I can only hope, lol. When I was a teen, “santa” would leave small gifts on the kitchen table each morning for me and my sister. I’ve wanted to do the same for my kids, just never “got around to it”. Thank you this might help! Awesome! Can these be cut with a Cricket??? You can use Cricut with the SVG files that are in the kit, however you have to use it with SCAL version 2 or MTC that was dated from earlier this year. Provo Craft put the kibosh on those companies making their programs work with Cricut. I´m new to these… Can I print and cut with silhouette? OMG, I love this! Does the last file, the one with the Santa and backgrounds, come with a cut file, or a PNG? Perfect! Such a great project for my Grandson (6yr’s old) & I to do tomorrow while we are together ALL day. Thank you Kerri! I am heading to the shop NOW! OMG these are adorable. I don’t normally have an advent calendar but this is making think twice. I have a daughter at college and this would be something so cute to send to her or her friend.